The rapper wrote a letter of appreciation for Paper. We’ve been overwhelmed by the response so far to our #MMF campaign with Detroit’s Downtown Boxing! If you haven’t donated yet, you have until Midnight EST tonight. Only 10 bucks gets you a chance to win the grand prize of a handwritten response from me to a “Stan” fan letter. Link in bio. Paper unveiled the next installment of its "rappers paying tribute to other rappers" series today. 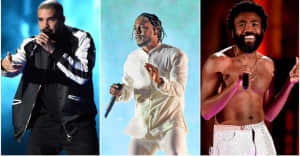 In the first essay, Kendrick Lamar remembered the importance of Eazy-E; the latest involves Eminem writing about his personal history with the music of Tupac. "The first time I ever heard Tupac was his verse on 'I Get Around' with Digital Underground," Eminem recalls. "I was 18 or 19 years old and I remember thinking, 'Who is this?' He stood out so much." "[Tupac] was taking things further than a lot of rappers at the time," Eminem continues, "pushing it to the next level as far as giving feeling to his words and his music. A lot of people say, 'You feel Pac,' and it's absolutely true. The way he chose which words to say with which beat was genius; it's like he knew what part of the beat and what chord change was the right place to hit these certain words... to make them jump off the track and make you feel what he was saying... Tupac was the first one to really help me learn how to make songs that felt like something." Eminem summed up his appreciation in simple terms: "He was a superstar in every aspect of the word." Earlier this year, Eminem also wrote a letter to Tupac's mother; read that here.